During the 2005, 2007 and 2009 legislative sessions, these four speakers served as rank-and-file representatives — not as speakers — for one or more sessions contemporaneously or near-contemporaneously. 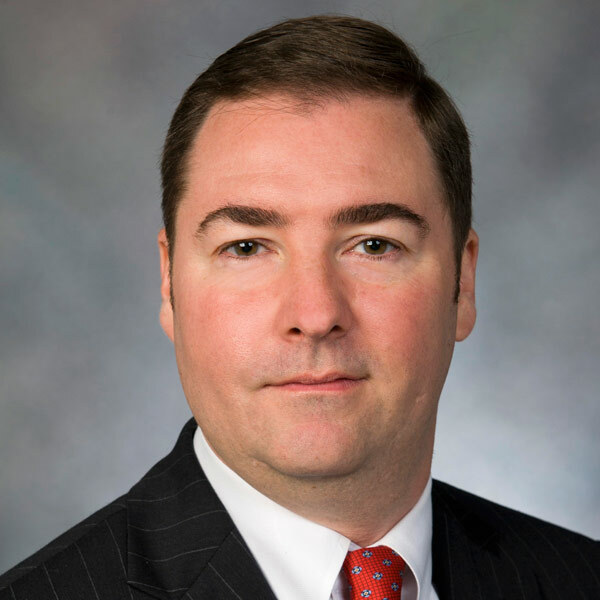 Laney was a rank-and-file member during the 2005 session, Straus during the 2005 and 2007 sessions, Craddick during the 2009 session, and Bonnen during all three sessions. While speakers in Texas rarely cast roll call votes, rank-and-file members cast hundreds. These votes can be used to locate the representatives in a comparable manner along the liberal-conservative ideological dimension that dominates Texas House floor behavior. In all, 1,677 non-lopsided roll call votes were analyzed for the 2005-2009 period to calculate every representative's Liberal-Conservative Score and the 95 percent Credible Interval (CI) surrounding this point estimate. The chart contains the Lib-Con Scores and 95 percent CI for the 186 representatives (107 Republicans and 79 Democrats) who served in the House at some point between 2005 and 2009 and who cast votes in 25 percent or more of the 1,677 roll calls. Those 186 representatives are arrayed from left to right with the four speakers highlighted by a green box. Within the context of the entire Texas House membership, Laney occupied a position slightly left of center and Straus slightly right of center, with Bonnen and Craddick notably further to the right. Of the four, the speaker with the least conservative Lib-Con Score was Laney. That said, for a Democrat, Laney was quite conservative, with a Lib-Con Score significantly more conservative than those of 52 Democrats and only significantly less conservative than those of two Democrats. Laney's Lib-Con Score was statistically indistinguishable from that of 24 Democrats (i.e., his CI overlapped with those of 24 Democrats as well as one Republican, meaning we cannot conclude with any certainty that he was significantly more or less conservative than them). Craddick’s Lib-Con Score located him significantly to the right of half of the members of the House GOP Caucus, with 53 Republicans significantly less conservative than him. In contrast, only one Republican was significantly more conservative than Craddick, with the remaining 52 being neither significantly more nor less conservative than him. Straus’s Lib-Con Score located him significantly to the left of more than half of the members of the House GOP Caucus, with 61 Republicans being significantly more conservative than Straus. In contrast, only five Republicans were significantly less conservative than Straus, with 40 being neither significantly more nor less conservative than him. Bonnen’s Lib-Con Score located him significantly to the left of 13 GOP House Caucus members and to the right of 25 members. Close to two-thirds (68) of the House GOP Caucus were neither significantly more nor less conservative than Bonnen. At the same time, however, Bonnen's 95 percent CI overlapped with that of Craddick, indicating that we can not conclude with any degree of confidence that Bonnen was notably less conservative than Craddick. And, in the three subsequent sessions (2011-15) Bonnen and Craddick’s 95 percent CIs always overlapped; separation occurred in 2017. Conversely, neither Bonnen nor Craddick's 95 percent CI overlapped with that of Straus, allowing us to conclude with a substantial degree of confidence that both voted significantly more conservatively than Straus. The above analysis provides a snapshot of the location of these four Speakers during a comparable period of time (2005-2009) when all were rank-and-file members for at least one session. 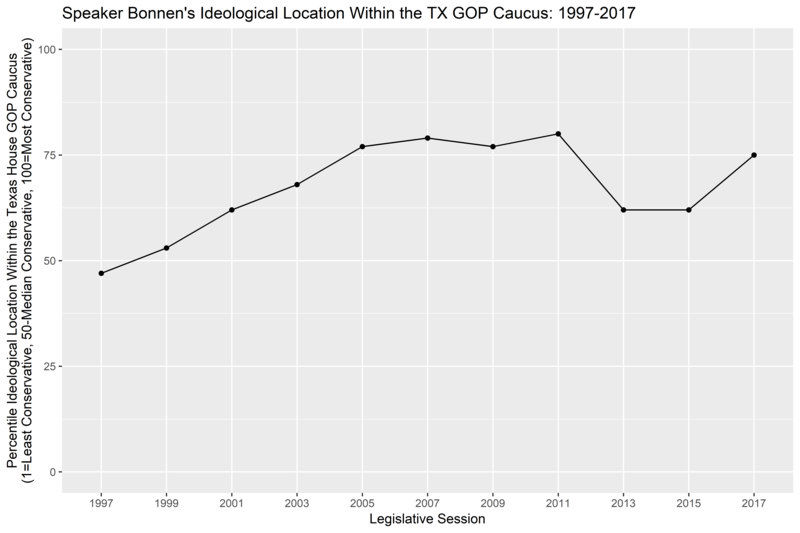 The next chart shows the evolution over time of Bonnen’s ideological location within the House GOP Caucus on a percentile scale. The Y Axis shows the least to most conservative members of the GOP Caucus during that session on a 1-100 scale. This second chart highlights how Bonnen’s position among Texas House Republicans became progressively more conservative throughout his first few terms in the House before leveling off between 2005 and 2011 at approximately the 75th percentile — meaning three out of four GOP House members had less conservative scores than he did. Bonnen's intra-party ranking moved back toward the GOP center in 2013 and 2015, as he became Speaker Pro Tempore (2013-2017), before returning to the more familiar terrain around the 75th percentile in 2017. Many Republicans were critical of Craddick for being excessively conservative and partisan (as well as too authoritarian) and critical of Straus for being insufficiently conservative and partisan. 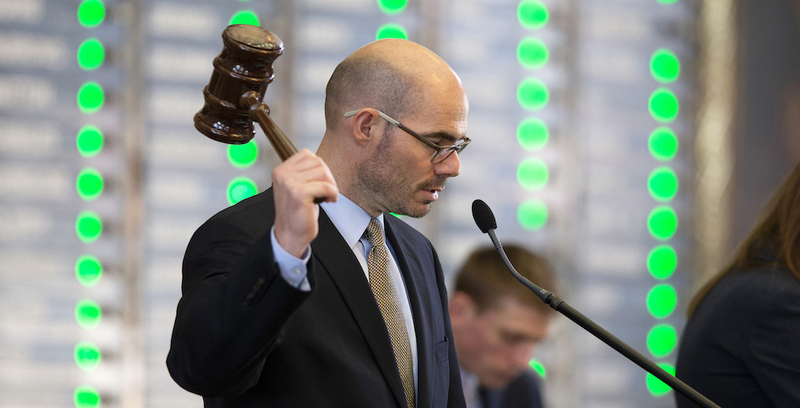 Bonnen’s legislative record suggests he may turn out to be the Texas GOP’s "Just Right" Goldilocks Speaker.